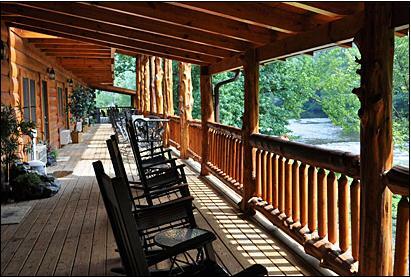 These Luxurious Log Cabin Room Rentals are Open For Business! 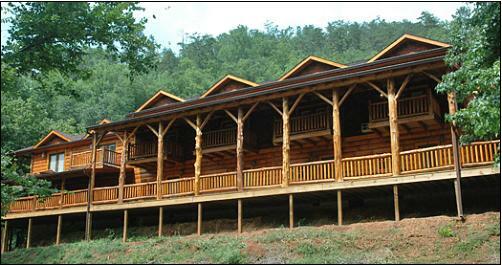 Located near downtown Tellico Plains, Tennessee. 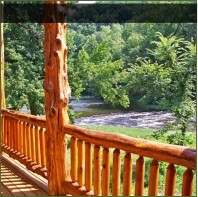 Located on Tellico River and across from the Cherohala Skyway. You Have to See These Deluxe Romms to Appreciate Them. Each has Balconies on the Front & Rear of Each Room. Six Single Units & Five Units With Two Floors. 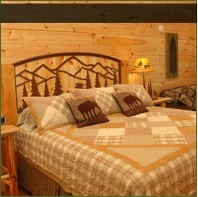 Single Units Have One King Size Bed or Two Queen Size Beds, & a Large Flatscreen Cable TV. Two Floor Units Have One Bed Downstairs & One King Size or Two Queen Size Beds Upstairs. They Have 3 Flatscreen TV's. Upstairs Have a Combination Refrigerator & Microwave. All Units Have a Small Compact Kitchenette Only. Rooms Come With Complimentary Coffee, Shampoo, Lotion & Hair Dryer & Iron. Check-In 2:00 p.m. - Checkout 11 a.m.